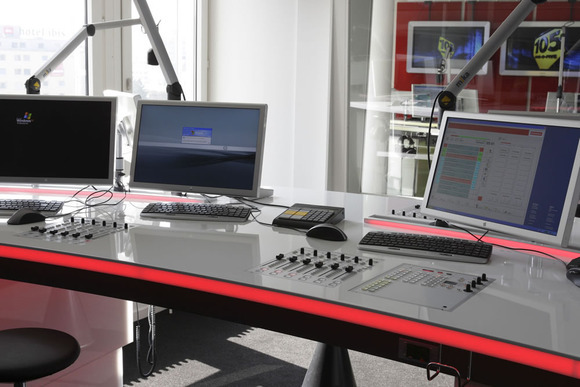 ZURICH, Switzerland — Having obtained two licences for Radio 105 and Radio Monte Carlo, the Music First Network is one of the most important private radio organisations in the Zurich area and the all-new production and broadcast studios, located in the World Trade Center in Zurich, have recently become operational. The main on-air studios are equipped with two Studer OnAir 2500 modulo digital consoles and the operating surface is integrated into the studio furniture for a functional and sleek design. The D21m I/O units are located in the master control room and each studio boasts two seats for the DJ’s with 12 and 6 fader units. All mixing desks are connected via the Studer ReLink I/O sharing system, which provides high efficiency in accessing the shared I/O capacities. A compact design, excellent user interface in combination with reliability and an excellent price-performance ratio, was crucially decisive in the choice of the Studer systems. Each of the studios are equipped with color LED’s to indicate the program that is currently on air. For example, yellow for Radio 105, blue for Radio Monte Carlo and red for Rock nation. Also, when microphones are open, the studios are bathed in a red light for additional security. Separate monitors also display the 3D-logo of the current program, which enables the engineers to accurately recognize the song currently running. The engineers control the peripheral devices, which include two CD players and a breakout panel, for additional convenience and efficiency. The rooms on the 4th floor of the World Trade Center are dominated by classical architecture, including curving studio wing houses, two broadcast and two layout studios, as well as management and marketing offices. Across the corridor are the rectangular offices for the editorial department, moderation and music editors, as well as sales, administration, accounting and technical staff. Being close to the airport was of prime importance because of the many renowned musicians visiting, especially when being engaged to perform in the studios of Swiss TV next door to the Hallenstadion. It is remarkable that one set of infrastructure serves the production of three nation-wide cable radio programs, two FM stations and four web-radios. The DigiMedia5 broadcast system handles all processes and provides a reliable and user-friendly operation for live and recorded programs. Studios are not assigned to one program as any of them can be broadcast from any studio. For more information on Radio 105 and Radio Monte Carlo, please visit www.radio105.ch and www.radiomontecarlo.ch.